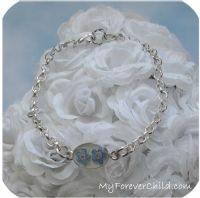 This gorgeous bracelet will be a comforting gift to anyone suffering the loss of loved ones. The two forget-me-not flowers can symbolize two or more losses. The Forget-Me-Not is a bright blue flower with a yellow center which is traditionally associated with remembrance of lost loved ones. Comes with our original Forget Me Not poetry card. Two genuine forget-me-not flowers are permanently encased in clear resin to bloom for all eternity. 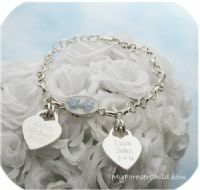 The sterling silver rollo bracelet chain can be made in your size, select below.